The Wells Fargo Center is undergoing $250 million in renovations as the arena's owners look to bring in a new type of fan — one that's interested in the atmosphere as much as the game. Dave Scott was a little downhearted. He was only months into his new job as president of Comcast Spectacor, lured from semi-retirement as a longtime executive in the company's expansive cable branch by the promise of a more lively and interactive role heading up its expanding sports and entertainment division. Yet on this day in 2014, shortly after he had established his new office and newest beachhead atop the Wells Fargo Center, something just didn't seem right. "I was kind of out, walking around the arena, and it just sort of started to feel tired," Scott, now the chairman and CEO of Comcast Spectacor, was saying from a boardroom near his office on the top floor. "I came upstairs and sat with Ed and said, 'You know, this has always been an 'A' arena property. And it's starting to feel like, well, it's time to do something.' "
Ed, of course, was Ed Snider, the late founder and owner of the Flyers, who died in 2016 at age 83. He got the Wells Fargo Center built in 1996 for $210 million, using private funding. If Scott thought this arena was tired, he should have been around back then, when sentimentalists dreaded the demise of the storied Spectrum even as it crumbled around them. Within months after the new building opened, that sentimentality faded. More bathrooms, expanded food choices, wider spaces, improved sound — and above all, luxury seating — all heralded a new age in sports entertainment. The new building was more than twice the size of the old one, with shiny linoleum floors and glossy tiles that stayed stuck to the walls and elevators that whisked people up and down. The lower bowl was exactly the same as it had been at the Spectrum. The seats even carried the bright red color scheme from the old place, bucking the trend of a more refined look. Why, there were even plans for its own new sports network, launched two years later. Yet now here it is, 22 years old, looking … well… tired. So Comcast Spectacor is investing $250 million to renovate the home of the Flyers and Sixers. Twenty-five years ago, tired meant only one thing: Bring on your wreckin' ball. Throughout the 1990s, sports arenas deemed antiquated were simply demolished, replaced with structures more than double their size. Phrases like premium seating, luxury boxes, and VIP club were the engines that drove that construction. Those offerings created revenue opportunities for owners and leagues that did not exist before, and radically changed the fan experience — especially for the larger corporations that could afford to lease those luxury boxes. Now, it is those concepts that have become antiquated as fans, particularly millennials, seek a more festival-oriented fan experience. But rather than tearing down the old, improvements in technology are allowing buildings to "gut as they go," remodeling the insides to reflect those changes. "We looked at it hard," Scott said. "Do we look at a new facility? This facility? Very quickly, as we got into it, we found there were 27 NBA/NHL venues that were built in the mid-'90s. None of them had been replaced or slated for replacement. They all were upgraded." Even the antiquated Madison Square Garden, opened in 1968 and upgraded in 1991, worked with what it had. The Knicks and Rangers played amid an incredibly ambitious $1 billion renovation that ended in 2013. Scott hired the same architectural firm — Brisbin Brook Beynon (which does business in the United States as Stadium Consultants International) — for the Wells Fargo Center's renovation, which actually began just before the Democratic National Convention two summers ago, when workers revamped all of the mid-level luxury suites. "We tried to take advantage of that summer when that's all we could have there," said John Page, the president of the Wells Fargo Center. Much of the festive red-seat color scheme that was carried over from the Spectrum in 1996 already has been replaced by a more luxurious dark gray, erasing the only tangible reminder of the arena's predecessor. But, as vice president of operations Phil Laws said, "That's the easy part." By the time renovations are done in 2020, corridors will double in width, luxury suites will be eliminated in favor of more open-spaced and socially interactive "fan experience" areas, and bunker luxury boxes — where affluent fans walk up stairs from underneath the event floor and into their courtside or rinkside seats — will be installed. Last, but certainly not least, at the end of this month, much of the building's outside wall will come tumbling down — literally. It will be replaced largely by glass, drawing the city's ever-expanding skyline into the Wells Fargo Center along with a new breed of fan. "That was a big discussion," Scott said. "Because it's not inexpensive." With the glass, and when all is said and done, the renovation is estimated to cost $250 million. That's $40 million more than it took to build what was then known as the CoreStates Center, and significantly more than comparable upgrades of '90s-era arenas in other cities. The estimate for upgrading Cleveland's Quicken Loans Arena during the next few years comes in at $130 million. In Atlanta, the price tag for changes at Philips Arena was $192.5 million. Boston's TD Garden cost $160 million to update. Here’s a selective look at the cost of improvements to some other arenas, including several built at or around the same time as the Wells Fargo Center. "We're in a great spot now," Scott said. "We feel good about where we're heading. I think it's going to be great timing. We owe it to our fans to take all of this — the teams, the building — to the next level. "We just felt like we had to capture that view," Scott said of the added cost from the glass. "A lot of people don't have our view." Phil Weinberg, the longtime executive vice president and general counsel for Comcast Spectacor, is a Philadelphia native. "I remember when the first building that was bigger than Billy Penn's hat was built," he said. "You look at that skyline today, and you think about being able to see that skyline from the building, which you really couldn't have done 25 years ago. It's pretty remarkable." Within that burgeoning skyline lies the impetus of change as well. Twenty-five years ago, the corporate base in Philadelphia was larger, Scott said. Leasing the 120 private luxury boxes that circled two levels of the arena for both the Sixers and Flyers was not the marketing task it has become in the city's current business culture of smaller — but more — businesses. Accounting firms, law offices, and the endless stream of start-ups that have both attracted and retained the city's growing millennial population — these are the coveted candidates for the building's rebirth. "More lounge areas, more social areas," Scott said. "The upper balcony has capacity for 1,100 people. We really see that as a social media place, younger — just hanging out." There's a potential downside to that, of course. If everybody's hanging out, who's watching the game? "We have our traditionalists, whether it is hockey or basketball," Scott said. "I'd say 80 percent are happy with what we have now. But we have to attract other fans, and to do that you need a different experience. We don't have as many of those boxes under long-term contracts as we had in the beginning. We've done well with that product selling them on a single-game basis. But it's just too much product." In the renovated Wells Fargo Center, the Mezzanine level will feature open-air lounges where fans can watch the game while socializing. Scott, Weinberg, and a few other executives did their due diligence. They checked out the work done at MSG and TD Garden, took looks in Chicago and Detroit, and saw what Tampa and Orlando did as well. They figured out what would work here and what might not. Between the game and the glass wall, the most important change fans will notice is the openness of the corridors, particularly at the ends of the arena. Sections 219 and 207 will open to provide a full view of the game below, with a choice of food options, including a menu that can be changed as the game proceeds. Large HD screens in those widened corridors will ease the anxiety over missing the action while getting a bite or quenching one's thirst, and the expanded points of sale will open opportunities for those involved in Philadelphia's vibrant restaurant and craft beer scene. "We have to come up with new food concepts… we definitely want and need the local tie-ins," Scott said. "We've used a lot of focus groups to try and figure it all out. Again, 80 percent is still the traditional fan. They like the hot dogs, the fries, all that great stuff. They love the old clips, the Broad Street Bullies. They're coming regardless. "We want to create a neighborhood." One that links that skyline to the building: restaurants, office buildings. "We've got a couple big ideas," Scott said. "We're looking at hotel concepts that would be perfect." There are even early-stage plans for apartments separated by a path that leads like a yellow-brick road toward Philly's skyline. "When we built this building, we were given future development rights for about 300,000 square feet of developable real estate, which could include office buildings, restaurants," said Weinberg. "Xfinity Live is the first phase of our development of those rights. It's probably 50,000 square feet. So that still leaves us with 250,000 square feet for further development rights. Future rights that we can go back to the city for." But first things first: The building is jammed with big-act concerts this month — U2, Journey, and Paul Simon, to name a few — and thus work will be mostly out of view. But as soon as Mr. Simon is done and homeward bound, subtlety ends. "End of the month, we punch the wall," said Laws, the man overseeing the daily renovation. "That will be a big day." 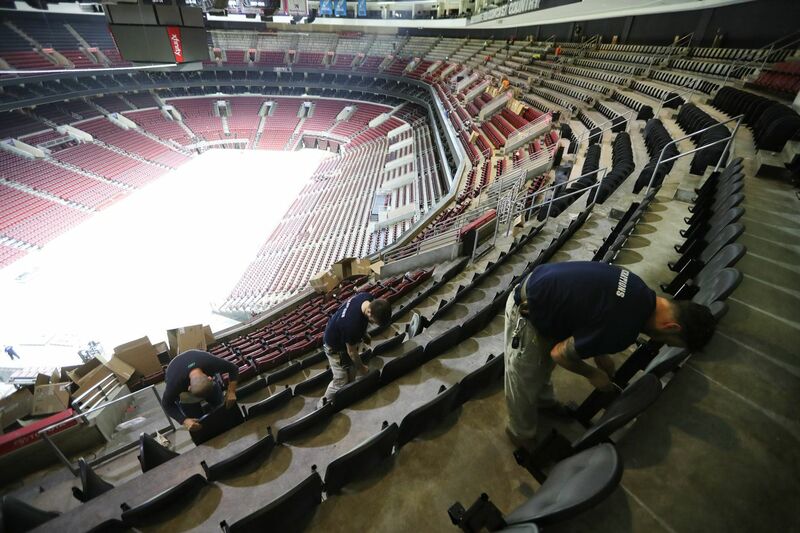 The Wells Fargo Center's renovations are in step with others happening within the building. With a continued infusion of home-grown players, the Flyers reached the playoffs — the first stage of their rebuilding. The Sixers' "Process" is likely to lure one of the key free agents available this summer — maybe even LeBron James. Sitting in some of those new seats with activity buzzing around him, Scott looks anything but tired. What will fans notice most? The Wells Fargo Center's owners think it will be the concourse corridors, which will be opened up to provide a full view of the game. Slide the white bar in the image below to envision what it will look like.